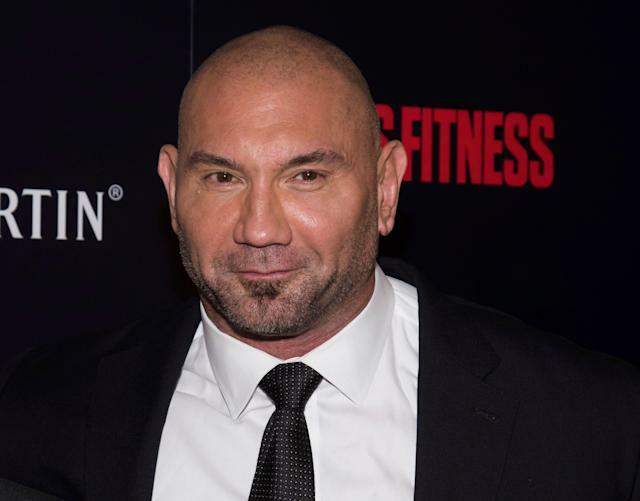 In his final wrestling appearance, Dave Bautista wanted to look like a superhero. He does play Drax in the “Guardians of the Galaxy” films, after all. So, in order to find the right outfit for Wrestlemania 35, Bautista turned to the experts: cosplayers. Bautista enlisted GSTQ Fashions to design the outfit. Catherine Jones, owner of GSTQ Fashions, posted a video about how it all came together on Youtube on Tuesday. It provides a pretty interesting look on what went into Bautista’s costume. As the 50-year-old Bautista explains, his only guidance for the project was that his outfit had to match his LeBron Soldier 11s. The video also reveals the biggest complication with making the outfit. Due to Bautista’s size, Jones couldn’t use a mannequin to figure out whether Bautista’s trunks would fit properly. Jones instead had to get creative, using a pot as a placeholder for one of Bautista’s thighs. The final challenge was to make sure Bautista’s outfit could withstand the rigors of a wrestling match. That influenced the fabrics and techniques used to make the trunks and boots. All in all, Bautista’s outfit turned out to be a success. Despite taking part in a no-holds-barred match — which he lost — Bautista’s outfit held together. The only thing he lost during the match was his nose ring. We’re going to guess GSTQ Fashions wasn’t responsible for that.